Check Out the CDITC Defense Investigator Store! 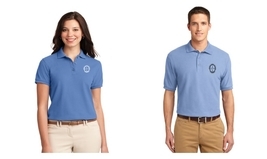 Proudly display the CDITC logo and enhance your professional image. A professional image when dealing with clients and potential clients is crucial to success. In addition, the image presented by criminal defense investigators while working in the field can often make or break a case. One of the best ways to present a professional image and clearly identify yourself is by displaying the CDITC logo. Our online store provides a wide variety of clothing and accessories that will enhance your image and allow you to proudly display the prestigious designation of a CDITC Board Certified Criminal Defense Investigator. Click on the image to visit our store! Purchase shirts, jackets, sweaters, hats, and accessories proudly displaying the prestigious CDITC Logo! Mandamus Veritas! CDITC VIP Authors Brandon Perron, CCDI, CFI-FTER, John Lajoie, CCDI, CLI and Rory McMahon, CCDI, CLI. 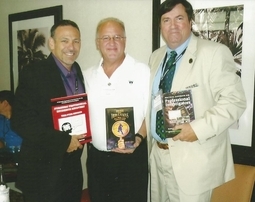 Forensic Testimonial Evidence Recovery - The FTER Method by Brandon A. Perron. 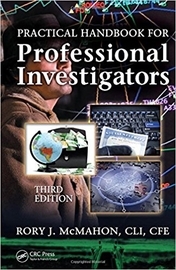 Practical Handbook for Professional Investigators, 2nd Edition, by Rory J. McMahon. A Comprehensive Guide for the Criminal Defense Investigator. 110 pages, Investigative Support Specialist, Inc., ISBN 978-0-9670615-0-4. A comprehensive guide for the criminal defense investigator. The philosophical and methodical approaches to the discipline of criminal defense investigation are discussed and presented in an easy to follow format. Written for public defender investigators and private investigators engaged in the field of criminal defense investigation. Includes, case studies, diagrams, and checklists. A Forensic Approach to the Interview for the Criminal Defense Investigator. 98 pages, Investigative Support Specialist, Inc., ISBN 978-0-9670615-1-1. Brandon Perron delivers his ability to simplify the methodical process of investigation to the discipline of Forensic Interviewing. He has added to the process with a new Forensic Interviewing book and methodology! Forensic Testimonial Evidence Recovery - The FTER Method was developed by Brandon as a supplement to the Component Method of criminal defense investigation. FTER enhances the investigative interview process by elevating the investigator's understanding of testimonial evidence as it relates to analysis, evaluation, recovery, and documentation. LESSONS IN LEADERSHIP: The Quest for Truth reveals the lessons of motivation, passion, team building, and leadership via the tales of a fictional character. The book chronicles the allegorical journey of Youngblood Hawke as he is transformed from a self-serving soldier of fortune to a warrior prince. Presented with the question and challenge of absolute truth by a mystical sage, Hawke's inability to respond is an epiphany to him and marks the beginning of his struggle and quest. Guided by a beautiful oracle, he is introduced to the teachings of Socrates, Plato, Aristotle, Sun Tzu, Machiavelli, Nietzsche, Jose Ortega, Shakespeare, and William James spoken through mentors, sages, and prophets. Marked as a threat to their power and control over humanity, the enemies of change seek to destroy him and his desire to understand. Youngblood Hawke's destiny as a warrior prince is realized when he raises an army of "Select Warriors" and leads them against the "mass," a secret and powerful society controlling many of the world's governments. Youngblood Hawke quickly learns that the spiritual and philosophical battle for truth will not only be waged on the battlefield but also within the darkest confines of the human mind, heart, and soul. THIS IS A MUST READ FOR THE PROFESSIONAL WITH THE HEART AND SOUL OF A WARRIOR! Click on Book Cover to Buy! - Presents a system that is easily adaptable to small assignments as well as complex litigation cases. Legal investigators are responsible for providing factual evidence – as the fact finders, they are the foundation for the attorneys they work with daily. The attorney is responsible for forming and implementing the legal strategy and presenting it to the judge or jury. The legal investigator provides checks and balances to ensure that no evidence is being forced upon a theory, and that no theory is being forced upon the evidence. Practical Methods for Legal Investigations: Concepts and Protocols in Civil and Criminal Cases presents legal investigators with a step-by-step process that reveals how to methodically find and report evidence in every aspect of the investigative process. Similar to the scientific principle of using research to prove or disprove a theory, the author’s Investigative Protocol is designed to find the facts that prove or disprove criminal charges, civil allegations, or elements thereof. The book includes case studies that clearly detail how the process of the Investigative Protocol applies to every assignment of the case and to the case as a whole. Comprehensive and methodical, the system provides a map to the truth. More relevant than ever, this edition adds two new chapters on death and terrorism investigations and several new sections. 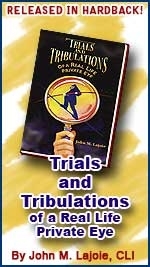 In Trials and Tribulations of a Real Life Private Eye, Lajoie tells his story, explaining the decisions and actions that allowed him to turn a struggling one-man operation into a successful agency. From the details of his work on high-profile homicides cases and as a member of elite criminal defense teams to the death threats and personal struggles that come with success in a dangerous business, Lajoie describes the reality of the world of private investigation as only an expert can.